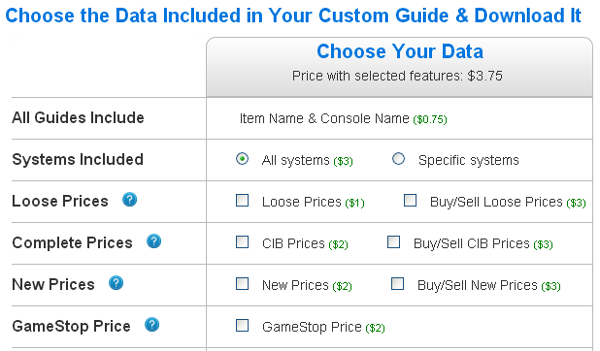 We have updated our video game price guide service to make it easy to use, fully customizable, and cheap. No account needed: You don't need to create an account and verify your email address before downloading a guide. Just start downloading. No email address required at all. 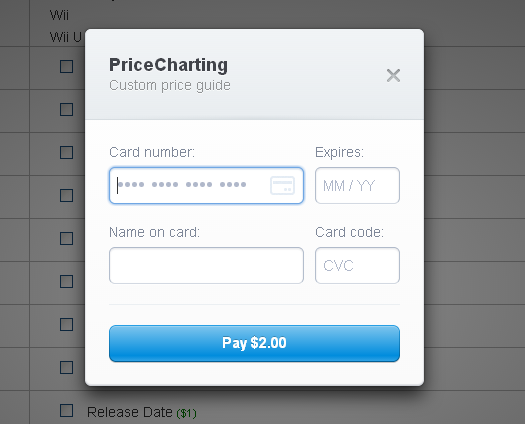 Pay with a credit card in one step: A simple four question form and payment is done. No address or zip code needed. You choose which consoles you want to include: If you only collect N64 games, only pay for info about N64 games. You choose exactly what data you want: You can include loose, cib, and new prices. UPC, Amazon ASIN, and eBay EPIN indentifiers. Suggested retail prices, release dates, and more. Checkout the video game price guides and customize your own today. If you choose to customize the guide you select the data you want to include like price, suggested retail prices, UPC, Amazon ASIN, eBay EPIN, etc. Choose from a list of consoles you want included in your guide. 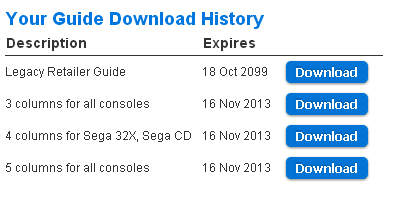 Each console costs $0.25 up to a $3 max. The payment form is very simple. You have the option of paying for your guide one-time or for a small premium you can get daily updates and setup recurring billing. 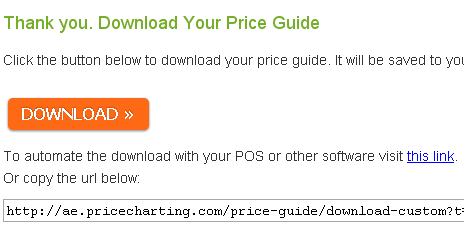 After payment you can download your guide immediately. If you subscribed you can bookmark the page to come back to download again with updated data. If you want to integrate the price guide into your point-of-sale software or other software you can use the url provided to automate access. An account is not required, but if you do have one you can see your download history in your account home page. Pretty Cool. Is the Guide/Nintendo Power set done yet? I see a misprinted Suikoden II CIB on ebay. How rare is that type of error for that game. @anonymous - I do not know much about misprinted games and their values. Generally they are more expensive than the regular versions because they are rare but I don't know how much exactly. Sorry. @anonymous - We have not started development on a full Nintendo Power price guide. We were working on these features and working through other features people have requested more often. You can visit our feature request page to vote on the features you want to see the most. @anonymous - Feel free to contact me at the 'Contact Us' link below and we can help you with some integration ideas and see what might work well with your retail shop. Thanks for putting this out there. I'll be in touch at some point. I'm going to give this some thought.